The 5DT Data Glove MRI Series is optimized for use in Magnetic Resonance Imaging (MRI) environments. 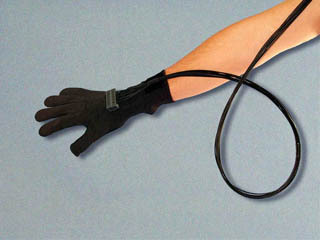 The glove itself does not contain any magnetic parts. It communicates with a control box (5-7m away) via optical fiber. The control box interfaces with the computer via a cable to the serial port (RS 232 - platform independent). 5-Sensor and 14-sensor models are available. Right- and left-handed models are available. One size fits many (stretch lycra).